HUDSON, Ohio, Feb. 5, 2019 /PRNewswire/ -- GEMCO Medical, a national distributor of medical products, is pleased to announce the addition of the GEMCORE360˚ brand of advanced wound care products. GEMCORE360˚ Advanced Wound Care offers healthcare professionals a simple, clear and cost-effective wound care range while ensuring excellent clinical outcomes for their patients. The product line includes transparent thin films, alginate dressings, silver alginate dressings, hydrocolloid dressings, foam dressings and PHMB foam dressings – all designed to maintain a moist wound environment, address bioburden, reduce pain and increase overall patient comfort. It is estimated that approximately 15 to 25 percent of individuals with diabetes will develop a foot ulcer at some point in their lifetime. GEMCO Medical was a pioneer in the diabetes supply industry over 27 years ago and has continued to evolve bringing on new product categories. The GEMCORE360˚ Advanced Wound Care product line is a logical addition to offer their healthcare professionals, so patients can receive the necessary treatment and find relief. "Our new wound care line is a great complement to the existing product lines we distribute,"said Rich Keirn, Vice President/General Manager of GEMCO Medical. "The GEMCORE360˚ brand was a natural fit and allows us to address our growing customer demands for affordable, high quality supplies while focusing on positive patient outcomes." 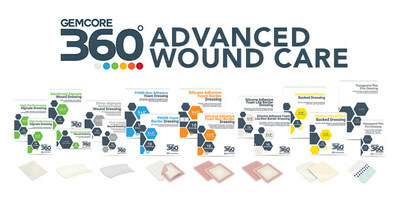 To learn more about GEMCORE360˚ Advanced Wound Care, visit www.gemcore360.com or contact sales@gemcomedical.com. GEMCO Medical, Inc., founded in 1992 and headquartered in Hudson, Ohio, is a leading wholesale distributor and logistics provider of a broad selection of quality, dependable medical products. The company's core product categories include diabetes, wound care, ostomy, respiratory, CPAP and durable medical equipment. With over 27 years' experience and over 45 manufacturing partners, the company prides itself on offering invaluable industry insight and product knowledge, competitive pricing and customized inventory fulfillment solutions for its customers nationwide. For more information, visit www.gemcomedical.com or call 800-733-7976.